When you’re looking for the perfect product for your folding chair hire needs, this item ticks many boxes. It’s a very elegant looking, thanks to the white fan back design on the seat back and the white frame. This means they fit many different events - both indoor and outdoor - and are one of our most affordable products too. Our white folding chair looks very modern and is a great accompaniment to many different types of contemporary events, the first seats that folded were first used thousands of years ago. In fact, it’s believed that the curule seat was the precursor to these kinds of chairs, and one reason why our clients may not have heard of these is because they were first used in Ancient Rome - an era that dates back to the 8th Century BC! Following this seat, which was used by elite members in the military or for the ruling powers, other models were developed that were also used by those running countries or armed forces. Although folding chairs had been in use for a long time, it wasn’t until 2 AD that literary works mention it in greater detail. Chinese military figures used it in their work settings and a poem from 552 references the seat in this way. Much has changed over the years regarding when and how this kind of seating is used, but some things remain the same! For example, our folding chair hire range is also useful for different kinds of settings - including those that are outdoors. It seems that folding seats have shown their convenience for thousands of years and continue to do so today. When you choose our product range, then you’re opting for an item that can be unstacked and set out in seconds. This is a fantastic benefit when you want to get venues arranged quickly and easily with seating. As well as being able to install locations very simply with our white folding chairs, you can also store them very easily. Once they’ve been folded, they take up little room, preserving your space. The fact they can be dismantled this way, and loaded on to lorries in larger batches means they’re also exceptionally affordable to transport. As this is a very affordable product to begin with, the cost effective delivery makes them the ideal folding chair hire item for those large occasions where you expect thousands of visitors, guests and delegates to arrive. When you’re arranging larger functions like this, or you simply want to keep seating looking very neat, then our linking loops are an ideal accessory. 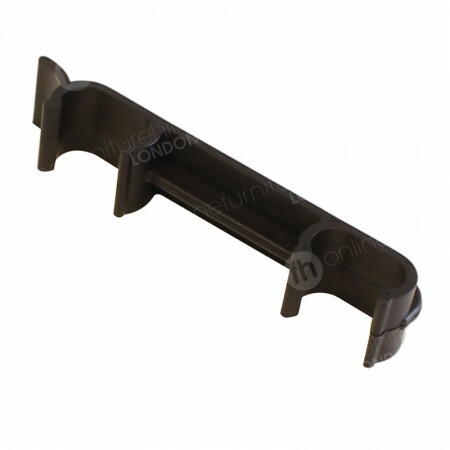 These are made from hardy plastic and just attach to the chair frame or leg. This allows you to link seats together so they stay in rows, keeping lines of exit and entry clear - which is sometimes essential in terms of health and safety. Visitors can also find their seats more easily once they return from breaks, making sure you get to use your allotted time for presentations more efficiently as people are seated quicker. Another top feature of this model is that it looks great, the fan back design is chic and complements both corporate occasions and those where you’d like a little extra style - such as award ceremonies and balls. Conferences look sophisticated, as do dining, entertainment and other functions, without the need to add any accessories to seating - just set them up and they’re ready! This item from our range is also suitable for outdoor use as well, because of the weather resistant steel frame, as well as the PVC seat. Although these kinds of products weren’t included in folding seating until the 20th century, they quickly became popular and remain so. You’re able to rely on this chic weatherproof chair, for all your outdoor occasions, from corporate balls, charity barbecues, weddings and functions that are also taking place in marquees, as the white frame perfectly complements bright and airy spaces. We also have Burgundy folding chairs in stock too, for those smart, stylish occasions that require a splash of colour. I’m looking for affordable conference chair hire - is this product suitable? This product line is a great combination of affordability and stylish design. They are often chosen for corporate events, such as conferences, as they look great in smart locations, but are they also make very cost effective folding chair hire. These look elegant - are they sturdy enough? The white steel frame results in a very robust seat, once unfolded, this item makes a very stable chair for lots of your occasions. Part of my event is outdoors - are these seats waterproof? Yes. The PVC seat and coated steel frame means that you can rely on them - even when you can’t rely on the weather! I need to hire thousands - do you have enough available? 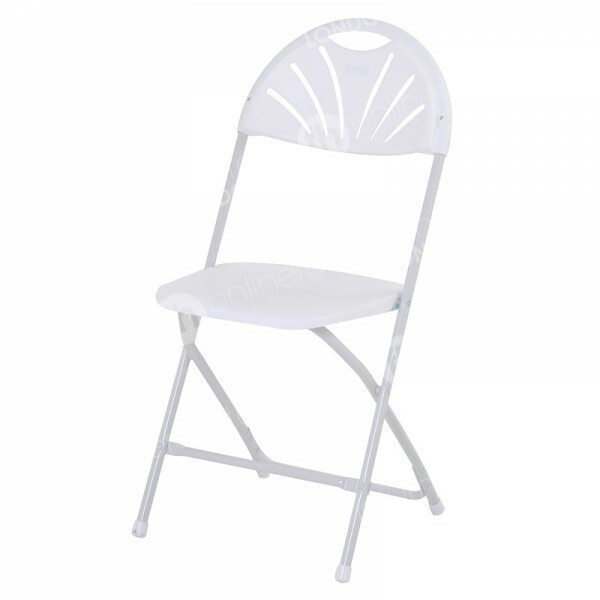 This is one of our most popular products and we make sure large numbers of white folding chairs are available to our customers. Are these chairs easy to set up? Very easy! Just unfold and set them upright. We deliver these products wrapped and on pallets, so you only have to unfold them and place them in your desired location. We’re able to help with installation of all your products too - choose this option when you order online. All events are totally unique so there is no set formula to what kind of furniture you should choose. We’re Here To Help!